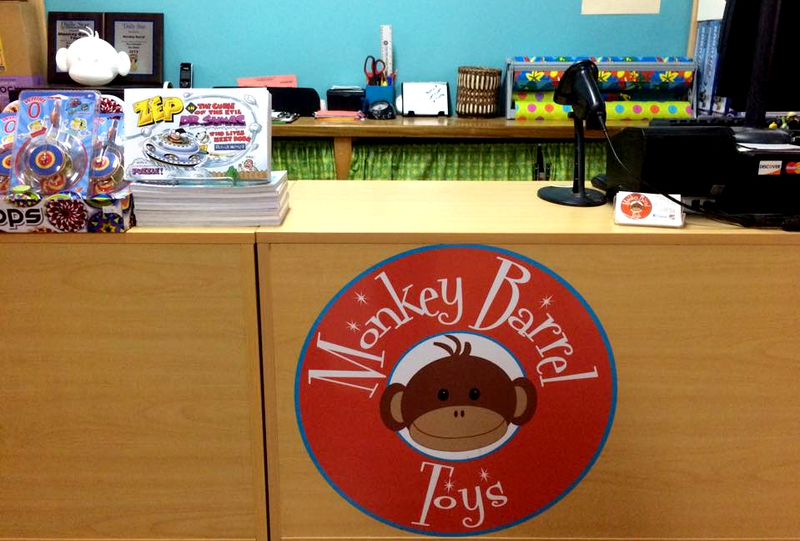 ZEP graces the front counter of what’s now my favorite toy store, Monkey Barrel Toys in Oneonta, New York. It’s owned and run by crossword constructor Kristian House. 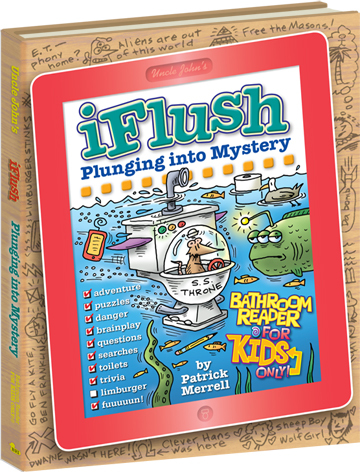 An action-packed tale of adventure, intrigue, and gadgetry for kids; a baffling, multi-step puzzle for adults hidden in the art. In a thud of inspiration about 25 years ago, I wrote and sketched up a book called Zep (in the Curse of the Evil Dr. Sumac Who Lives Next Door). The book’s 130 pages were held together using a single binder ring. When my daughter came along, I started reading Zep to her, and it soon became one of her favorite stories. For years I’ve dreamed of turning Zep into a real book, and the time has finally come. But I’m looking to do something I’ve never done before — self-publish. You can help in that effort by pre-ordering the book on Kickstarter (you’ll also get some insider extras). There are additional levels of involvement, such as buying yourself a piece of original art from the book, that will help in funding the project. EVERYTHING IS EXPLAINED HERE. Here’s a “fun” puzzle, adapted from one that appears in iFlush: Hurtling thru History. Click on the image to download a PDF. Last Tuesday morning, I met up with Chaeli Mycroft (2011 winner of the International Children’s Peace Prize) and her mother Zelda in New York City. 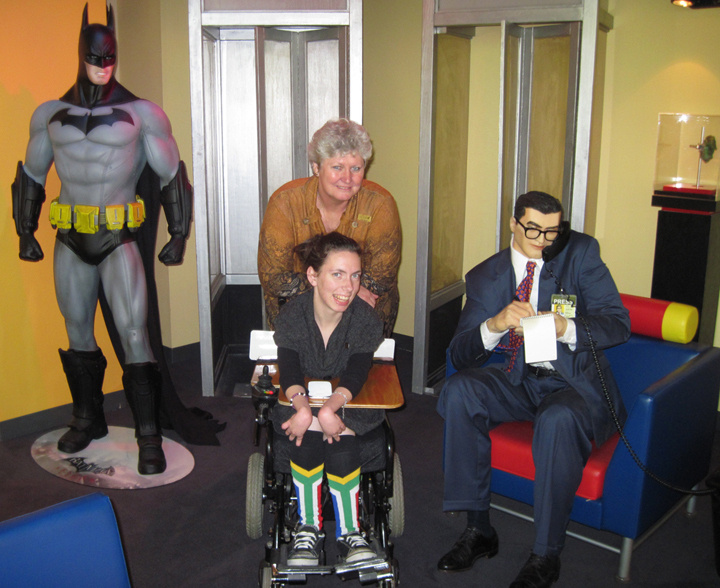 These two women (Chaeli is now 19) are the core of the Chaeli Campaign, an organization based in Cape Town, South Africa, that works to help children with disabilities. Chaeli was born with cerebral palsy but has turned that into an asset, raising money and awareness and speaking up for those who can’t. I came to know Chaeli while writing about her for an upcoming book, iFlush: Hunting for Heroes. She certainly qualifies as a hero (here’s a four-minute video that tells her story) and, after our meeting, I now know her mother qualifies as well! She’s a strong force and voice for the cause … and someone who won’t let anyone depart without a big bear hug. Chaeli is a magnet for important awards, and she was in town to receive the 2013 World of Children Award. 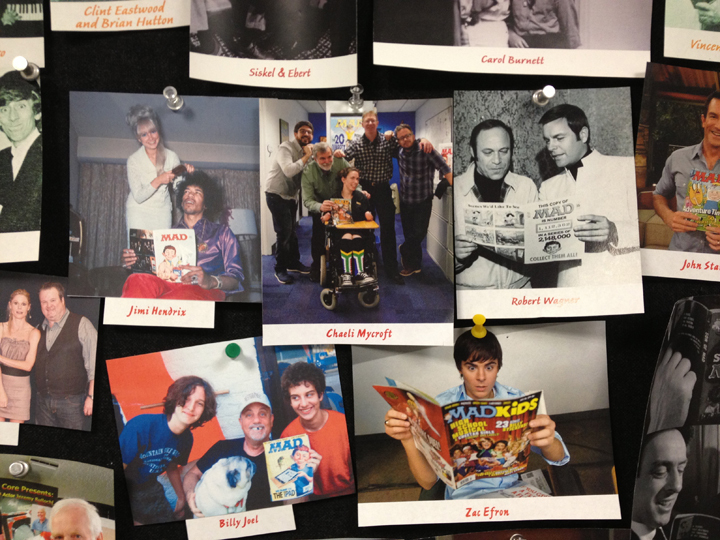 But she had a few extra days, so I arranged a change of pace from the hoity-toity world of important awards and fund-raising charities — a visit to MAD magazine. 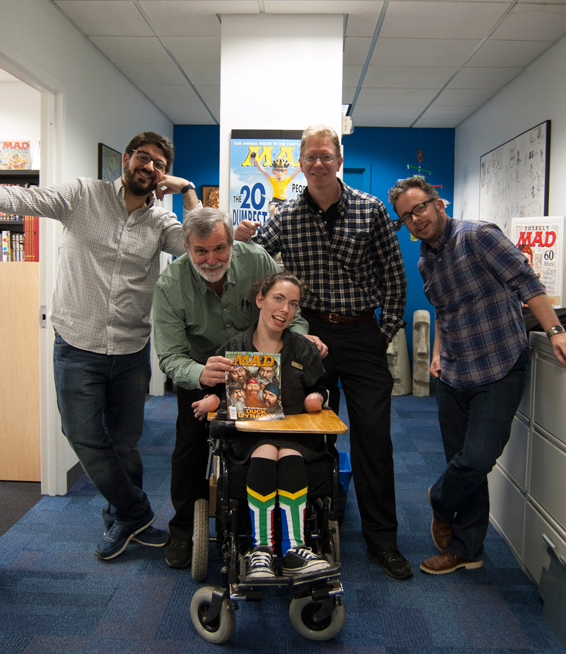 We met up just south of Grand Central Station to grab a round of coffees at Starbucks, then hopped in a cab — NYC has a fleet of 233 cabs with wheelchair lifts — and made our way over to MAD headquarters at 1700 Broadway. I think the MAD crew got as much a kick out of it as Chaeli and Zelda did. Here’s the cover we didn’t use. To find out the actual title, click on the cover. Inside you’ll find a dozen of our patented Top Ten Jumbo Puzzlers, plus a quintet of Top Ten Fun Fact pages covering today’s sizzlingest celebrities. Also, back by popular demand, seven types of puzzles and a six-page treasure trove of trivia. 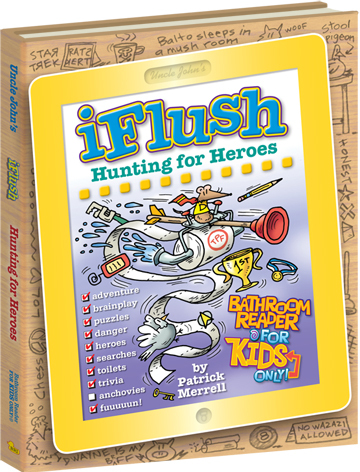 Puzzles and art direction by Patrick Merrell; edited by Cutler Durkee and Lisa Russell; photos by Linda Pacheco; brought to fruition by Isata Yansaneh; published by Time Home Entertainment; 128 pages; $11.99 less on Amazon. • An entire section of puzzles for each Hunger Games book and another for the movies. • Fascinating Hunger Games facts at every turn. • 8 types of word search puzzles: regular, jumbo, plot search, one-word, clue, quote, trivia, and THG. Edit/design by Patrick Merrell; puzzles by Jamie and Patrick Merrell; cover by Anne-Michelle Gallero; published by Time Home Entertainment. $12.99 less on Amazon. • Bathsheba Everdene, the lead character in Thomas Hardy’s Far From the Madding Crowd, inspired Katniss’s last name. • WINNERS’ DESPOT is an anagram of PRESIDENT SNOW. • In a 2012 People magazine poll, the “which hunk do you like best?” voting favored Peeta over Gale, 73 percent to 27 percent. • Suzanne Collins found occasional relief from the realities of working on The Hunger Games by writing episodes of Wow! Wow! Wubbzy!, a preschool Nick Jr. show. • Other fictional Buttercups: the princess in The Princess Bride, a unicorn in Toy Story 3, and a tomboy Powerpuff Girl.